Sam Blewitt has detailed on his involvement in the Tale of the Brave feature-length special. The veteran vocalist of the CGI era of the TV series returned to sing Tale of the Brave. Earlier this month, Roll Along Thomas spoke to Blewitt about how his song came to being. In the usual manner, Hit contacts [composer] Robert Hartshorne to put a song together, he contacts me to see when I can sing it, then we get together at his studio and start working. It didn't quite fit. So Robert and I recorded another version, which is the one you hear now. The song of the same name as the story was used briefly in the special but didn't appear in its full form as an extra on DVD. Blewitt has since reacted to this. I wasn't aware if it not being used as an extra on the DVD or that it was a shortened version. The producers used a different type of song by another writer and producer [Eggplant LF] for the end title song [Let's Be Brave], I know nothing about that to be honest. I'm not aware of any plans of it to be released in full, of course I would like to see that happen. Lending his voice to more than ten songs in the franchise, the singer commented on the reception he has received. The feedback has been fantastic. I'm very proud to have been associated with Thomas the Tank Engine, it's part of our heritage in a way. I'm honoured that the fans think so much of my work, I really enjoy working on the songs. I do keep the songs. [I] also have some of the films and DVDs we've worked on. I need a few more DVD's, so I'll hopefully get the collection up to date soon. 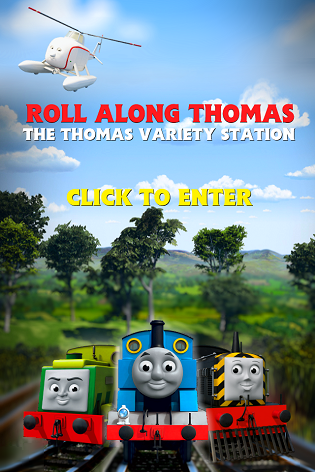 Apologies for sounding off topic here, but didn't you say you were ending Roll Along Thomas in August? Well, October isn't far away now. So... farewell when the time comes, I guess.